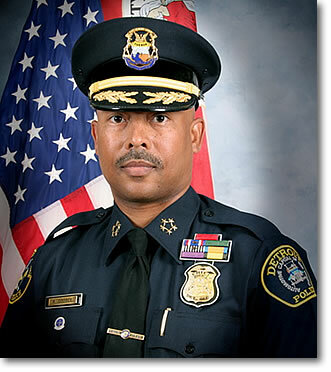 In an effort to get to the bottom of what is going on within the Detroit Police Department, I recently sat down with Ralph L. Godbee, Jr., chief of the Detroit Police Department. His comments on the record were nothing if not candid and they offer incredible insight into the problems facing Detroit. Below is an unedited transcript of our lengthy conversation. Thank you for taking the time to talk with me this afternoon, Chief Godbee. It's a pleasure, Frank. I just want to start by saying that I love how you host those monthly pizza parties and bring folks from as far away as Ann Arbor to spend money here in the city of Detroit. Everyone who is a part of Team Bing appreciates you doing that. Why, thank you, Chief - it's good of you to notice. Now, if I may, I'd like to ask a question that might seem a little harsh, but so many Detroiters are asking it, I'd be remiss if I didn't put it to you: Chief Godbee, why do you need to have 12 assistants? Well, it's simple - I like my coffee with coffee cream and sugar. I'm sorry, Chief Godbee, are you telling me that you need 12 people to get you a cup of coffee? Not just any cup of coffee - one with cream and sugar. I'm sorry, I'm just not following you. Well, you need 1 person to get my favorite mug from the cupboard, another to make coffee, a third to pour the coffee, a forth to add the cream, and a fifth to add the sugar. Then, of course, you need someone to stir the coffee. A seventh person then brings my coffee to me. Once I'm done, the eighth person retrieves the empty mug and takes it to the ninth person who washes it before handing it over to the tenth person to dry it before the eleventh person puts it back into the cupboard. I have a feeling I'm going to regret asking this, but what does your twelfth aide do? That's the commander who is assigned to my office. He supervises the entire operation to make sure that it runs smoothly. I'm sure that's absolutely vital to the Detroit Police Department's mission. However, given all of the constraints that DPD has, wouldn't it be better if the Department didn't have a total of fourteen assistant and deputy chiefs of police and all of those officers assigned as aides to one assistant or deputy chief? There have been a few people who have made such an argument, but I'm not convinced. That's why I decided to commission a study by nationally respected experts to look into this idea. Yes, they come from all across the nation and, because they're all getting paid, they all respect each other. Just ask them. And when will we see this report for these nationally respected experts? We'll have some bullet points for you right around the next mayoral election. Okay - well, let's switch gears, shall we? A 9 month infant was gunned down inside her own home Greenview Street in the Warrendale neighborhood this past February. At the time, you called it a "wake up call for Detroit." 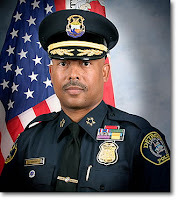 Chief Godbee, why hasn't the Detroit Police Department made any arrests in this case yet? Yes, that was tragic killing. During each of the prayer vigils for that young infant, I vowed that this would serve as a wake up call for all of us. Oh, yes - we are definitely awake. And we went to some prayer vigils. No, we still need the community to come forward with more information. But we know that this shooting was the result of an argument at a nearby between someone who lived at that house and one of the shooters. The infant was just caught in the crossfire. We know what bar all of this happened at and when it happened. We have descriptions of the shooters and their vehicle. What else does your department need? It would be nice is someone in the community came forward with a sample of the shooter's DNA. That would help us a lot, but we haven't gotten it yet. What about the man who was shot and killed on Rutland Street recently, a decorated Vietnam veteran who died protecting his granddaughter from five thugs who broke into their home? Or the two teens who were shot and killed with the assault rifles near the Southfield Freeway last week? No one has come forwards with a DNA sample from those assailants either. We really do need a basic level of cooperation for the community in order to make these arrests. I feel like I'm going to regret asking, but any news on your department's investigation into the death of Margaret Theut? The 71-year old Warrendale resident who disappeared last November and whose remains were found this past June in Rouge Park? Well, we have Mrs. Theut's DNA obviously. However, we still need someone to come forward with a DNA sample from her killer. Once we have that, I'm sure we'll make some progress. [Returning to my seat. ]Thank you. Yeah, a lot of people do that when they interview me for some reason. Okay - let's move away from specific investigations and talk about your department's response time to 9-1-1 calls. In November of last year, the City of Detroit's Performance Dashboard - one of the things that Governor Rick Snyder insisted Detroit start using - showed that your average response time was 52 minutes. However, at the same time, you were telling reporters that your response time was only 28 minutes. Chief Godbee, why would you report one statistic in one place but give reporters a completely different number? I wouldn't know about that. I don't monitor our performance. I have all of these national conferences to go to, speeches to give, and awards to accept. So, who is monitoring DPD's performance? You mean, when they're not making your coffee? Chief Godbee, I've talked to reporters - both here in Detroit and elsewhere - who tell me that they simply do not believe you. There was also an informal survey that I took that found that 62.4% of Detroiters don't believe your statistics about Detroit crime rate either. How do you respond to this? Quite frankly, I don't think about that. None of the consultants that I've hired have asked me about it so I just don't think about such things. I leave those details to my staff - you know, when they're not busy with other things like my coffee. Don't you worry that a lack of believablity in what the Detroit Police Department does will ultimately hurt the criminal justice system? Well, I'll put it this way. Every arrest in a criminal case ultimately has to go to a jury, which is normally made up of Detroiters. If a police officer testifies in a courtroom that he found a certain piece of evidence in a suspect's home, the jury has to believe him in order to accept the validity of that evidence. If Detroiters don't believe you when you say that crime is going down, and they don't believe you when say that your response time is improving, isn't inevitable that sooner or later Detroiters in the jury pool will simply stop believing what your officers testify to in a courtroom? And, if that happens, isn't our criminal justice system basically toast? That very well may happen. Luckily, I have a plan in place to deal with such an eventuality. Damn straight. I figure I'll just keep trotting out one excuse after another for a couple more years. Mayor Bing seems happy to believe them. When it comes down to it, the fact that he is willing to believe that I'm doing a good job is all that really matters. By the time things completely go to hell, I'll be living somewhere outside of Michigan. Therefore, none of those things will be my problem. I'll be giving speeches at one of the universities whose professors I previously hired as consultants. Everyone else will have to figure a way out of this mess, but it won't be my problem. My only problems will be my golf game and figuring out how to make my own coffee. Now, Frank, I've enjoyed our conversation today. Unfortunately, though, I have to bring this to an end. I have to take of a very important assignment. Today is my turn to wake Mayor Bing up from his afternoon nap so he can talk to the governor. Well, I guess all Detroiters hope that Mayor Bing wakes up soon. Obviously, this is a piece of political satire. However, I can't help feel sad about how little of it is fictional. The links above provide references to all the things that I discussed in this piece.